I have written in my recent editorial about the nonsense of plasma vitamin D measurements. A recent case history of a patient with a deleted vitamin D carrier molecule GC now confirms the free-hormone hypothesis. The patient’s plasma 25(OH)D levels was only 0.4% of those in the unaffected sibling. Despite a lifelong deficiency of vitamin D binding protein, limited sun exposure (for religious reasons), and a diet that was probably lacking sufficient vitamin D, our patient did not have rickets or osteomalacia but rather osteopenia and fragility fractures that occurred in the fifth decade of life. Another carrier sibling had only two third of the plasma 25(OH)D level compared to the unaffected sibling but showed “no appreciable clinical manifestations”. and give their babies more raw milk avoiding supplemented milk. Just for the notes. Wer glaubt schon der Deutsche Gesellschaft für Ernährung? Immerhin doch Einige: Die Deutschen Apothekerzeitung berichtet aktuell über zwei Fälle von akuten Nierenversagen bei ausgeprägter Hyperkalzämie,. Did we trade rickets with allergy? I have written on that before but find it striking again when reading another historical perspective. The first insight into the possible relationship between the industrialization of Northern Europe and rickets was made by Sniadecki in 1822 when he concluded that children who lived in the inner city of Warsaw had a high incidence of rickets because of their lack of sun exposure. This was based on his clinical observations that children living in rural areas outside of Warsaw did not suffer from rickets while children born and raised in Warsaw were plagued with the disease. Now we are supplementing vitamin D to nearly all inner city children who have a high allergy prevalence but not so much in rural areas where we see less allergy – everywhere, not only in Warsaw. A third class of mammalian photoreceptor cell was discovered during the 1990s: the photosensitive ganglion cells. These cells do not contribute to sight directly, but are thought to support circadian rhythms and pupillary reflex. “extraocular photoreceptors” are usually found in the central nervous system or in the skin, but also frequently in internal organs. … All the visual cells identified in animals detect light using a single family of proteins, called the opsins. These proteins grab a light-sensitive molecule – derived from vitamin A – that changes its structure when exposed to light. The opsin in turn changes its own shape and turns on signaling pathways in photoreceptor cells … The skin is where we see most other light receptors, particularly in active color-changing cells or skin organs called chromatophores. Here we show that four opsins—OPN1‐SW, OPN2, OPN3 and OPN5—are expressed in the two major human epidermal cell types, melanocytes and keratinocytes, and the mRNA expression profile of these opsins does not change in response to physiological UVR doses. 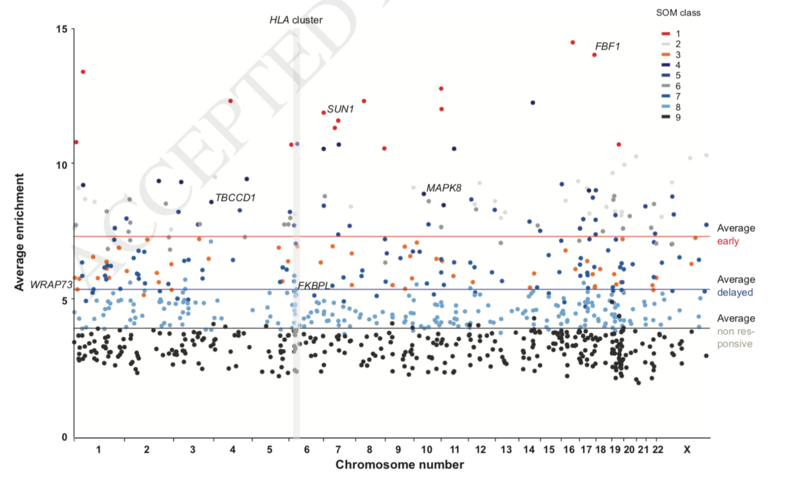 … Notably, OPN2 and OPN3 mRNA were significantly more abundant than other opsins and encoded full‐length proteins. Our results demonstrate that opsins are expressed in epidermal skin cells and suggest that they might initiate light–induced signaling pathways, possibly contributing to UVR phototransduction. Human OPN5 also had an absorption maximum at 380 nm with spectral properties similar to mouse OPN5, revealing that OPN5 is the first and hitherto unknown human opsin with peak sensitivity in the UV region. OPN5 was capable of activating heterotrimeric G protein Gi in a UV-dependent manner. which came into life by just a single mutation. As far as I understand it, UVR exposure is not leading to any opsin expression. Maybe it is just a very low threshold trigger for TYR et al ? A recent review in Current Biology pointed out that vitamin A-based chromophores were initially used in harvesting light energy, but have then become the most widely used light sensor. Unfortunately many research questions have not been answered yet. We can only speculate about the function of extraocular photoreceptors in humans. In the mammalian retina it is probably part of a self-defense mechanism of the eye to avoid UVR induced destruction. There could be similar functions in the human skin including circadian entrainment, DNA protection and repair. Vitamin D production in the skin after UVR exposure is an independent process as ergosterol itself can efficiently absorb UVB radiation. Finally here is a speculation about the pathophysiology: Extraocular photoreceptors could be key structures in photophobia, phototoxic and photo allergic reactions. It is a serious backslash to the pro vitamin D lobby that has been published in the Lancet Diabetes & Endocrinology last week. Our findings suggest that vitamin D supplementation does not prevent fractures or falls, or have clinically meaningful effects on bone mineral density. There were no differences between the effects of higher and lower doses of vitamin D. There is little justification to use vitamin D supplements to maintain or improve musculoskeletal health. Odds ratio 1.00. There is nothing to add. Vielleicht hängt der Anstieg von Allergien ja damit zusammen, dass wir aufgehört haben, gegen Pocken und BCG zu impfen”, vermutet Aaby. Er fragt sich sogar, ob das Einstellen der Pocken-Impfung nicht auch Schaden angerichtet haben könnte, weil nun das Immuntraining durch diese Impfung ausfalle. We identified 767 articles, of which 17 satisfied our inclusion criteria; there was only 1 randomized controlled trial, with the remaining studies being epidemiologic investigations. Meta-analyses did not show any protective effect of vaccination against the risk of sensitization, as judged by specific IgE tests or skin prick testing …BCG vaccination is unlikely to be associated with protection against the risk of allergic sensitization and disease. We found no association between having been vaccinated against smallpox in childhood and risk of atopy or allergic rhinitis. Smallpox vaccination was associated with a slightly decreased risk of asthma. There was no association between age at smallpox vaccination and risk of atopy, allergic rhinitis, or asthma. Adjusting for birth cohort, sibship size, age of the woman’s mother at birth, and social class in childhood did not change these results. Es geht hier auch nicht so sehr um eine neue wissenschaftliche Diskussion, sondern um die journalistische Aufarbeitung eines “Dokumentarfilms”. Nach Masernimpfung hat im übrigen Seif Shaheen in Guinea-Bissau mehr(!) Allergien gefunden, was aber wohl auch fraglich ist, da hier nicht nur die Impfung, sondern die medizinische Betreuung generell (“iatrogen”) zur Debatte steht. Interessanterweise wird in Guinea-Bissau auch Vitamin D zur Tbc Prophylaxe gegeben wobei Vitamin D selbst ein Allergierisikofaktor ist. Es ist schon kurios, was das Web manchmal zu Tage fördert. Zum Beispiel ein Vortrag des Vitamin D Experten Dr. oec. troph. Achim Zittermann ( Bad Oeynhausen ), der Clara Sesemann aus dem Heidi Roman eine Rachitis andichtet. 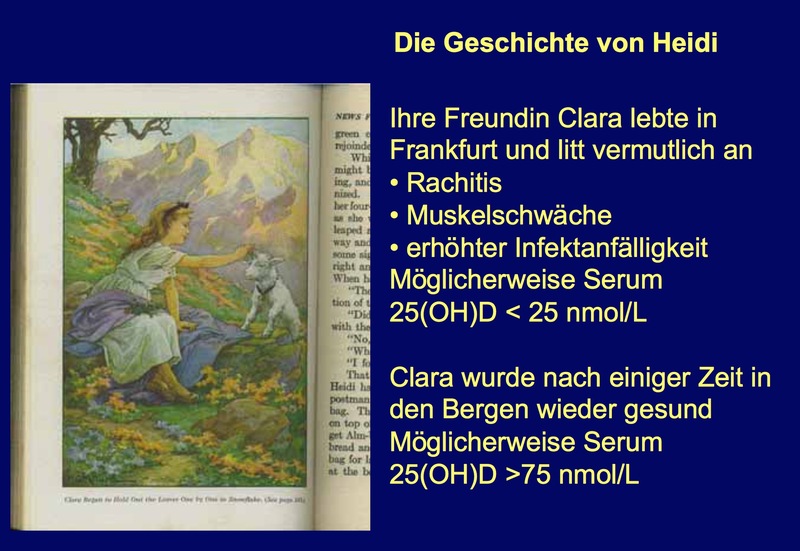 Im Original bei Johanna Spyri kann man aber nachlesen, dass Clara regelmässig “Fischthran” bekommt, also hochdosiert Vitamin D (und A). Wenn Claras Symptome also wirklich auf eine endokrine Störung zurückzuführen wären, dann müsste es sich um eine Vitamin-D resistente Rachitis Typ I oder II sein. Beide Formen reagieren aber nicht auf zusätzliche Sonneneinstrahlung in den Bergen. 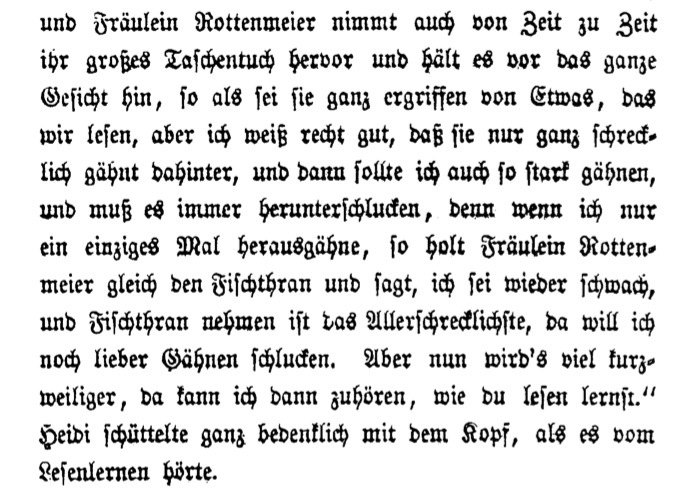 Die Heidi Geschichte des Vitamin D Experten ist also genauso Unsinn wie seine 18300 Toten durch Vitamin D Mangel. 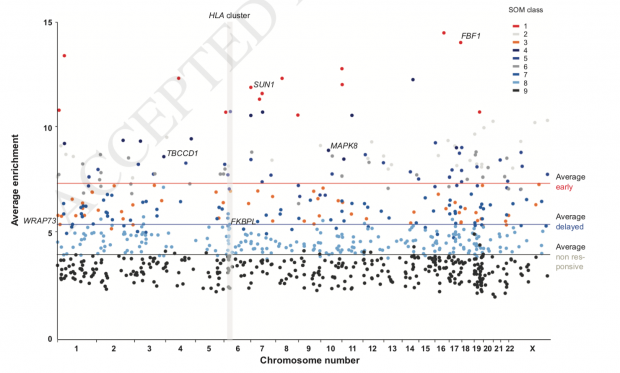 Refutation of the vitamin D hypothesis? 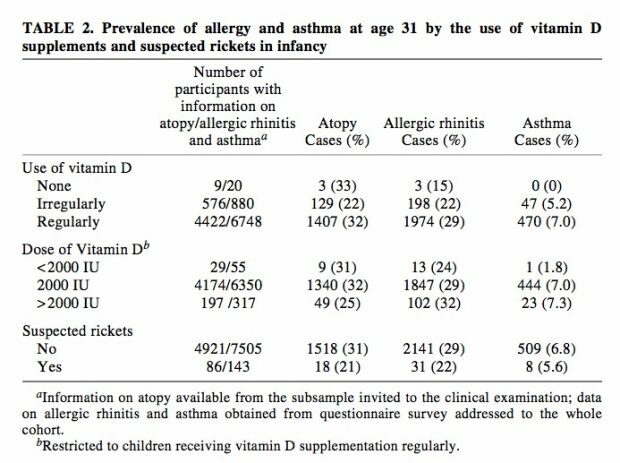 A new epidemiological study arguments against vitamin D inducing later allergy (Parr et al., Vitamin A and D intake in pregnancy, infant supplementation, and asthma development: the Norwegian Mother and Child Cohort, Am J Clin Nutr 2018;107:789-798). Table 5 in the most recent paper shows no effect when correlating first year of life supplementation and later asthma. But why did they authors not even cite our study from 2004 (Hyppönen et al. 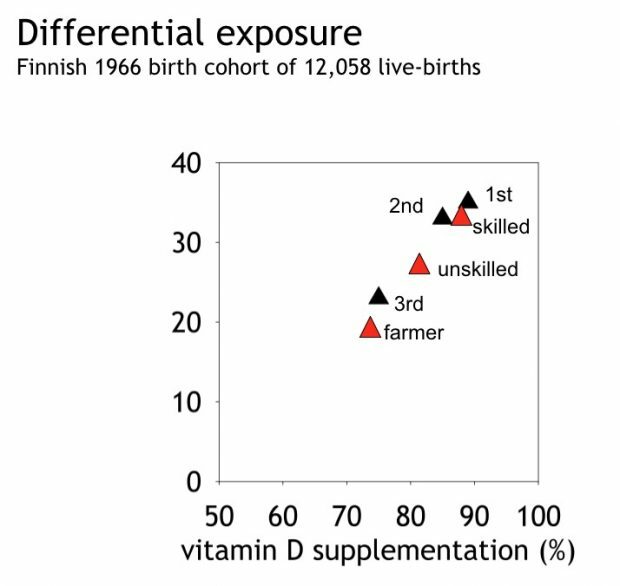 Infant Vitamin D Supplementation and Allergic Conditions in Adulthood Northern Finland Birth Cohort 1966. Ann. N.Y. Acad. Sci. 1037: 84-95) ?? Although our interest was more with allergy there have been clear effects on asthma that have been confirmed now two dozen times. Why did the authors miss that effect? The cohort consists of 115,000 children but only 55,000 are analyzed. So selection bias is omnipresent. A key issue is the definition of “asthma” as “having ≥2 pharmacy dispensations of asthma medication within a 12-month interval, which is more a “last resort” option than a correct diagnosis. “We cannot rule out some misclassication in our asthma outcome“. I agree. Another issue is the unrecorded vitamin supply by standard baby food in the range of 500-1000 IU/daily. Does it make any sense to test for excess supplements in a population that is already heavily exposed to >90%? “A limitation of this study is that we did not have data on nutrient intake from supplements in infant“. I agree, it makes the study worthless. The supplementation with cod liver oil, vitamin D and multivitamins is chaotic as been shown in the last row of table 5. In real life or just in this paper? Numbers are contradicting “Vitamin D only, sometimes” and “daily” do not add to the number given for “vitamin D only” in the “combined use” section. Supplementation at month 6 is even a late event if we believe that the first allergen contact under vitamin D exposure is being important. So, still not need to drop the vitamin D hypothesis.